In order for Motorcentral to operate correctly, it needs to be associated with a database that stores all the information related to your dealership. These instructions detail the various options available for connecting your Motorcentral software to a Motorcentral database. 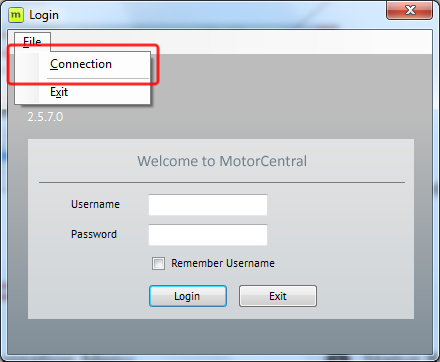 Run Motorcentral and when you are presented with the login Screen, select File > Connection from the Menu bar. Sometimes you will be supplied with a connection code to establish you Motorcentral database connection. In this event switch to the Use Connection Code tab and paste the code given into the field provided. Select the Use Demo tab and then check the type of demo database you would like to execute. If you have correctly entered your Database Connection details you will be returned to the login screen and may login. If however you are presented with an error, please verify you have entered the connection string correctly and if the problem persists contact our support team here.